When we were planning our SEO event, Tom Anthony was one of the first names we jotted. Meet Tom Anthony. Most people who know him in the industry simply call him TA. Tom has been at Distilled for 7 years now, initially in the consulting team, but for the last few years he has led the team building DistilledODN, an SEO A/B testing platform which allows a more data driven approach to SEO. 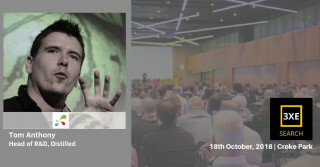 On October 18th, 2018 Tom is speaking at 3XE Search Conference in Dublin. Distilled is a well known name in the SEO industry and for over 10 years they have helped businesses of all shapes and sizes to thrive in the online world. Their skills span a wide range of creative and technical areas, allowing them to cover every corner of a digital marketing campaign. At the upcoming 3XE Search Marketing event, Tom is delivering a presentation on the topic What if ‘what’s good for users’ isn’t good for Google? Combining CRO and SEO testing. In this session, Tom will introduce SEO A/B testing, highlight some interesting results from those tests, and share some preliminary results from the new full funnel methodology. “For those who haven’t previously encountered SEO split-testing, I will be introducing how that works. I’ll then reveal some of the surprising results we have learnt from running many tests. SEO Tools that Tom recommends! What influences Tom on a day to day basis? Check the 3XE Search Marketing Event Schedule and book your tickets ASAP! previousEverything you think about your analytics is probably wrong! nextLet's Close that Technology Gap!